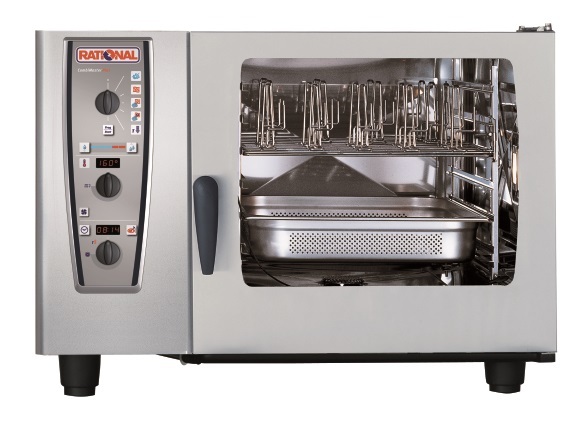 The CMP62 is an outstanding electric combination oven with 6 x 2/1GN capacity; combi steamer humidity control, individual programming of 100 cooking programmes each with up to 6 steps and 60 – 160 meals per day output. The CombiMaster Plus models always convince with functions that are effortless to use and which provide top food quality. Functions such as the patented dynamic air circulation, which optimally distributes the heat in the cooking cabinet and which provides for outstanding results. Together with the flow-optimised cooking cabinet shape, culinary delights are produced in no time. Crusts become crisp, breaded coatings crunchy and roasts juicy – quickly and reliably. The powerful, renowned RATIONAL fresh steam generator ensures you get intensive colours, great flavour and that vitamins and minerals are preserved, such as when steaming vegetables.